1. Are you pleased with your prints? Why / Why not? 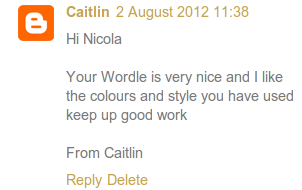 Yes, because it looks really nice. Crayon and Dye, because it was nice and easy to do. 3. What is your least favourite print and why? Wet Ink, because I rolled the roller too hard and it made it dark. 4. What did you find easy? 5. What did you find hard? Make my wet ink not too dark. 7. Who / What has helped you in the printmaking process? 8. What is something you have learnt from printmaking? Cutting out my silhouette athlete. 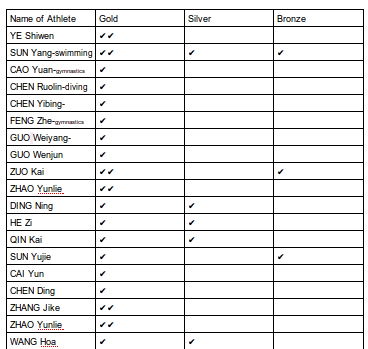 This is my Medal Graph on China's Medal Winning Sports. As you can see China's Winning Sport is Diving. In Diving they have won 6 gold medals, 3 silver medals and 1 bronze Medal. I think that China has won 6 gold medals in Diving because they always practise and they will never give up. China has done well in the Olympics and they Managed to come second with a total of 38 gold,27 silver and 23 bronze medals. This is my China Medal Tally as you can see China has done very well in the Olympics and have earned lots of Medals they have done well in the 2012 Olympic Games. This is my Medal graph on the 2012 Olympic Games. U.S.A won the Olympics with a total of 46 gold medals, 29 silver medals and 29 bronze medals. China came second with a total of 38 gold medals, 27 silver medals and 23 bronze medals. I think that U.S.A and China won because of there population and that they always practise and will never give up. New Zealand did really well and got a total of 6 gold medals, 2 silver medals and 5 bronze medals. Introuduction Valerie Adams is a famous New Zealand Shot putter. She has broken lots of world records. D.O.B and Family Valerie Kasanita Adams was born on the 6th October 1984 in Rotorua, New Zealand. She had a Tongan mother her name is Lilika Ngauamo and an English born father his name is Sydney Adams. She had several brothers over 7ft Education She was a shy child, she is very tall and she is very good at Basketball. She went to Otatara Primary School Auckland. She also went to Mangere High School. She belongs to the church of Jesus Christ of Latter Day Saints. At the age of 13 her P.E. teacher noticed that she had a strong throw. Sadness In Valerie’s life there was sadness. Her mum Lilika Ngauamo died in 2000 when she was only the age of 15. It was really sad because her mother was her inspiration. Achievements Valerie Adams has broke many world records for shot put. She broke the record for shot put in bare feet in the Junior championships. Also she won a Gold medal at the 2006 Commonwealth Games and at the 2010 Commonwealth Games. In Jamaica she threw a shot put 17.73 m. In 2008 Adams broke the Oceania record in winning her first World Indoor Title in Valencia (20.19 m). Valerie Adams has won 12 gold medals, 5 silver medals and 1 Bronze medal. Coaches Her first coach was Kirstin Hellier, she was a well known Javelin thrower. They met in 1998 and they were together for 11 years. Her second coach was Didier Poppe in 2010. Her third coach is Jean Pierre Egger and he is still coaching Valerie. She has done very well under him. 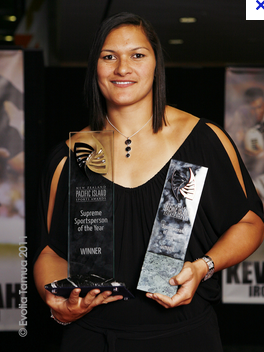 Valerie Adams will always be a winner and she will make New Zealand proud at the London 2012 Olympics.